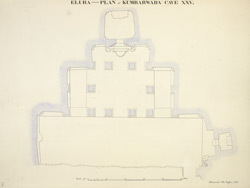 Plan of Cave XXV, Kumbarwada, a Hindu cave temple at Ellora from James Burgess' 'Original Drawings [of] Elura Cave Temples Brahmanical and Jaina, IIII.' The spectacular site of Ellora, in Maharashtra, is famous for its series of Buddhist, Hindu and Jain cave temples excavated into the rocky façade of a cliff of basalt. The works were carried out under the patronage of the Kalachuri, the Chalukya and the Rashtrakuta dynasties between the sixth and the ninth centuries. ?Cave XXV, is known by the names of Kumbarwada and Suresvara, is about 70 yards. The plan shows that behind a hall about 90 feet long, of which the front has fallen away, is a smaller one, 57 feet wide by 23 feet deep and 13 feet 10 inches high, with four square free-standing pillars in front and two in antis. Inside there are two others, with corresponding pilasters on the side walls; and in the back, separating it from the antechamber to the shrine, are two more free-standing pillars, with two in antis. These pillars have brackets, and on the front of each bracket a male and female flying figure. ?